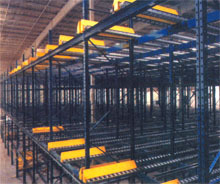 A stationary rack structure and dynamic roller mechanisms suitable for standardized pallets or larger containers. Gravity flow pallet movement from loading face to discharge face. Typical systems are up to 5 pallet lanes high and up to 20 pallets deep. Flow rack has capacities up to 4000 lbs per pallet.